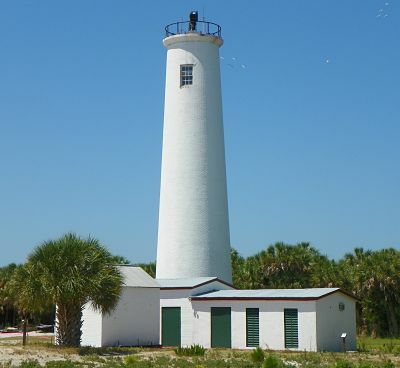 Accessible only by boat, Egmont Key is an island located in the mouth of Tampa Bay that is unique in many ways. It was formed from a river delta thousands of years ago it is home to gopher tortoises, sea turtles, nesting shore birds and migratory birds. It is used today by many boaters and beach goers for recreational activities. It has played an important part in America’s history as well as the history of Florida. It is home to a lighthouse that was built in 1858 and the beacon is still maintained by the Coast Guard as an aid to navigation for ships and recreational boaters. Egmont Key was occupied by the Union Navy for most of the Civil War as a part of Operation Anaconda, the blockade of the south. It was also a safe haven for local residents that were against secession. The island was a yellow fever quarantine site for troops returning from Cuba during the Spanish American War. The fortifications on the island were built in response to a need for coastal defense during that time. Egmont Key was also an internment site for Seminoles on their way to reservations in the Midwest after the Third Seminole War which ended in 1858. Perhaps the greatest threat to the islands future is the erosion of the west beach. To learn more about this issue and how you can help, go to the "About the Island" tab and click on "Erosion Issue". The Egmont Key Alliance, Inc. is a non-profit organization formed by the citizens of the community to support Egmont Key State Park and is registered as a non-profit, tax-exempt corporation under section 501 (c) (3) of the Internal Revenue Code. As such, your Membership and Donations may tax-deductible. Consult your tax professional to be sure.